After an arduous chase of a thief through the city that left Raven in tough shape she finds respite with old friends as well as the thief herself. 'Princeless: Raven The Pirate Princess' #2 picks up where the first issue left off and the result is a miracle of a story that's funny, uproariously subversive and completely enchanting. Raven awakens in the care of a friend who served under her dad's command, Cookie, his daughter Jayla and the aforementioned thief Sunshine Alexander. Jeremy Whitley masterfully develops each character through distinctively concise but colorful dialogue that distinguishes the characters easily. The intelligent beyond her years yet feisty Jayla has a cantankerous relationship with her seemingly affable father as young kids often do. Sunshine is full of life, confident and inquisitive. The montage of interviews is one of the most subversively hilarious condemnations of "men's rights" and online sexism through the lens of pirate tropes is ingenious and inspired. It takes the storytelling to an entire new level of comedy and plotting while cleverly mocking the ills of today. Eventually, Raven finds a tall noble woman willing to fight for injustice as a pirate who coincidentally resembles Brienne of Tarth from Game of Thrones. She's just what she was looking for and isn't afraid to toss a chair in a bar to clear the room. And a satisfying brawl begins with the quick-witted Jay putting an end to the shenanigans with her "witchcraft." Rosy Higgins and Ted Brandt create such a warm and inviting landscape of characters and scenes that the action is served well and the facial expressions tell their own story. They compliment the story so well by emphasizing the emotions in each character's face and body language. The colors are subtle but effective in setting a mood - a bright sunny morning, a dimly lit greasy dive bar. 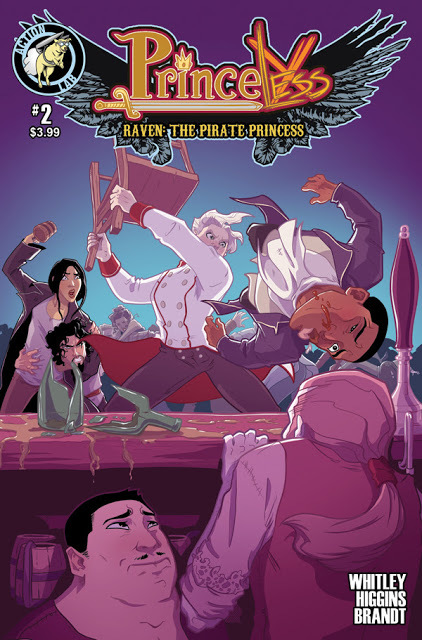 'Princeless: Raven the Pirate Princess' #2 has everything you expect in a pirate adventure and much, much more. It's funny and exciting with characters you instantly care about and get intelligent satire as a bonus. The wondrous thing is the book truly is an "all-ages" story that can be enjoyed from 8 to 80 years old. It transcends genres while introducing characters of color matter of factly. It is a world, even a fantasy world, as the world looks now. Full of different people with amazing stories to tell. This is one of those amazing stories that must be read.